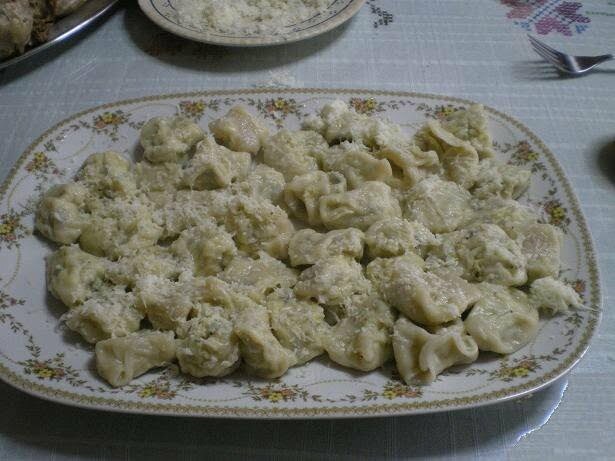 Kaloirka is a traditional Cypriot recipe, which is a pasta dish filled with minced veal or beef, similar to tortellini. I presume that they may be a remnant from the Venetian rule on the island!! They take their name from the word “kalogeros” (“kaloiros” in the Cypriot dialect), which means monk, as their shape resembles a hat worn by Greek monks. This was the first time I made tortellini with ground meat. I usually make ravioli with a cheese filling but it was something I wanted to make for a long time now, as I remember my mother making them for us. The first one is the traditional way, which is rather time consuming. Cut round pieces of dough, using a round cookie cutter (9 cm – 3 inches diametre), add a tsp of meat filling on one side and fold to form a semi-circle. Brush the cut circle with water and add 1 teaspoon of the meat mixture into the center. Fold the edge closest to you over the filling to meet the other side, press to seal the edge. Then join the two ends together and fold the top side together with the two ends. Boil the pasta in chick stock. The other way is much easier. You can make them following the same procedure as the Cheese Ravioli. Can I make the pasta ahead? You can make kaloirka ahead and freeze them. Put them on a tray with cling film between each layer. When they have frozen, remove into zip lock bags, to save space in deep freezer. Cook them as they are, in chicken broth, without defrosting them. Serve them with lots of halloumi on top. Other pasta we can make at home. Heat the olive oil in a sautéing pan and sauté the onion and garlic until translucent. Add the ground veal, mix and then add the wine. Add salt and pepper and cook until the entire pan juices have evaporated, mixing from time to time. No water is necessary. When done, add parsley and mix. Cut round pieces of dough, using a round cookie cutter (9 cm - 3 inches diametre), add a tsp of meat filling on one side and fold to form a semi-circle. Bring chicken broth or stock to a boil and add some salt. Place them in salted, boiling water and cook as any other pasta, for about 10 – 15 minutes stirring occasionally, until they will float. Remove with a slotted spoon into a platter and sprinkle with grated halloumi or anari. great job ivy! wonderful entry! i have never tried my hands at ravioli…kudos to u..come over to my blog for a lil something for u!! Hi Ivy….yes I heard the radio program yesterday night….that was so sweet of you to take my name..
Wow, I haven’t had ravioli in such a long time – they are one of my favorites! Yours look so good, Ivy! Your beef ravioli looks really good. I have been wanting to try making my own ravioli for a while now. Thanks for sharing with Presto Pasta Nights! Yummy! And you make me feel like I could make these like you, even though I’m a total pasta illiterate! Sounds so easy when you explain how to do it, Ivy! I have never made my own pasta… it’s just so easy to pick it up at the supermarket and just boil it and add some sauce. Ah, I had it in my list past Christmas and Santa Demetri was good enough to bring it to me. I think you wrote this post just for me! I love ravioli. I’ve never tried making homemade, so kudos to you. Great tutorial, ravioli is great and I would love to try some of yours. Hi Ivy, I have never tried this, but it looks great!!! Delicious work! Its been a while since I made ravioli. For me, it was a somewhat frustrating experience, but then again, it was also one of my first home-made pasta dough experience (which probably wasn’t a good idea). But you’ve inspired me to get back to it! This looks delish Ivy. I have never tried making my own pasta, but really want to try in the future. They do look wonderful. Thanks for sharing with PResto pasta Nights. What’s on tap for next week?